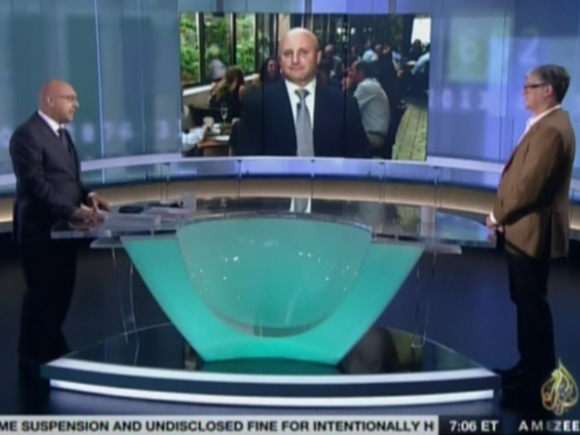 The highly anticipated Al Jazeera America went live Tuesday afternoon and its on air look is similar to that of used on its sister networks, but also adds a touch of America in key places. 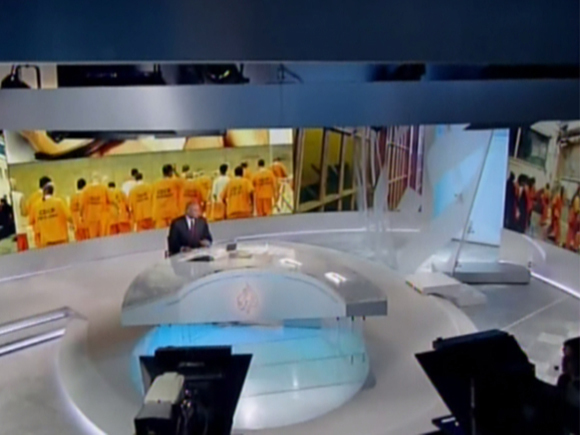 The clean, almost sterile look neutral wall and floor colors, massive video walls and simple graphics that emphasize typography over design elements that have become a trademark of Al Jazeera channels all make an appearance on Al Jazeera America. 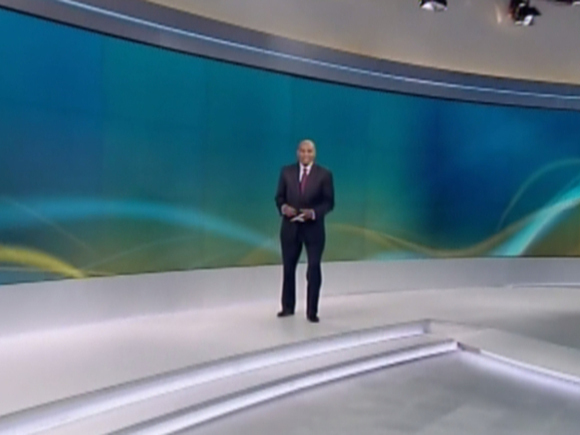 The network’s main set, which NewscastStudio exclusively previewed earlier this month, is dominated by multiple nearly seamless video walls that are used for standups, weather and as backdrops for the anchor desk. The studio’s half moon shaped anchor desk also bows upward from the center, creating the illusion of a floating structure. It is fronted with the network’s logo and subtle splash of light focused on the emblem. The surfaces of the set are largely white, silver and light blue, allowing the video walls to be the standout visual star. The network uses a combination of subtle blends of color and topical graphics on the video walls to help enhance storytelling. From a graphical standpoint, the network’s look and feel is largely centered around highly stylized natural and urban landscape imagery. A common theme throughout the network’s opens and other animated elements are flying bursts of light that sweep over and around the landmarks seen in the imagery and eventually merge together to form the network’s logo, as seen in this video clip of the generic news open. The graphics used during segments, however, are a simple mix of clean typography and blocks of white, black and the occasional color. 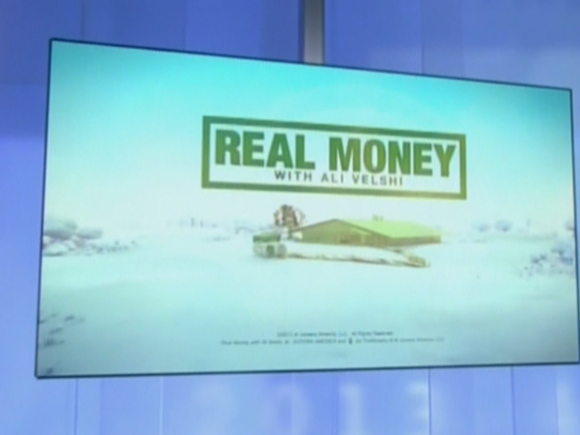 “Real Money” makes use of more creative camera angles and moves, including having host Ali Velshi walk around the studio during segments. The studio also includes hanging panels set that are used for both storytelling and promos shot in a more fluid style. 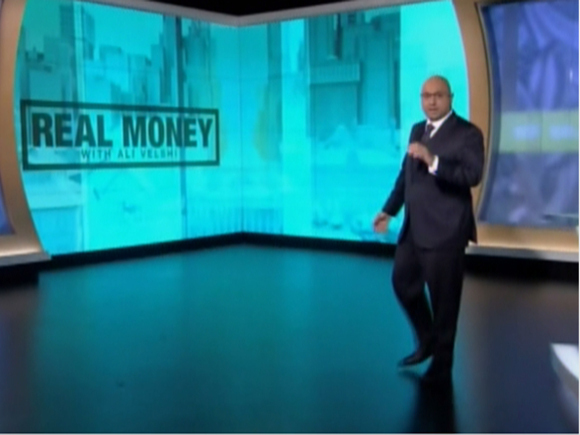 While Velshi stands in front of the corner video wall for some segments, a standing anchor desk with a glowing, internally lit glass base ringed by a curved glass surface is also available to him. 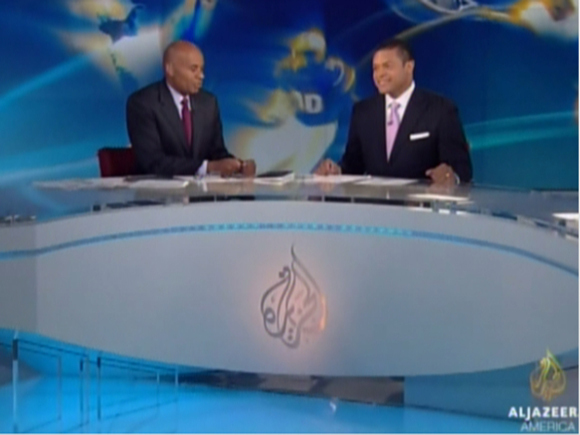 A three panel video panel array is used for both remote guests and topical graphics. The network’s flagship show, “America Tonight,” originates from the Washington, D.C. studios located within the Newseum. Here again, video walls make up a good potion of the set, though backgrounds also include views of Washington mixed with colorful backgrounds. 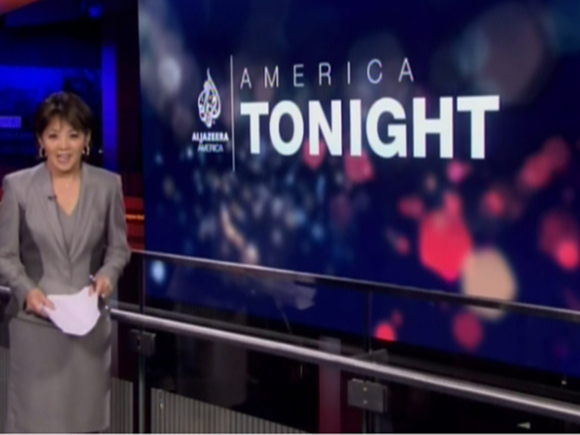 The “America Tonight” graphics use a much more elegant, darker look, with deep purple-blue backgrounds accented with magenta and gold. The show’s opening is an impressive sequence that emphasizes the multilayer, in depth approach the program will take. Read more about the show’s intro here. “America Tonight” anchor Joie Chen stands next to a large video panel for the show’s opening block, which is shot off axis. 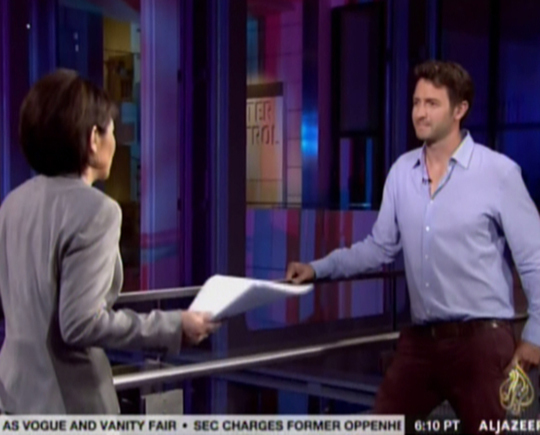 She can then debrief an in studio reporter, as shown above, at the same spot, with both of them casually leaning against the metal and glass railing. 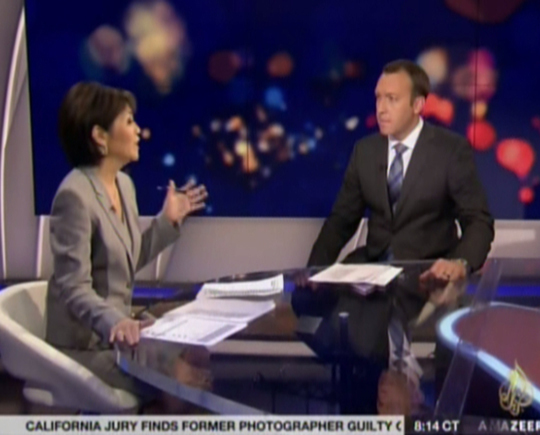 The show also makes use of an anchor desk location that also includes room for reporter debriefs.